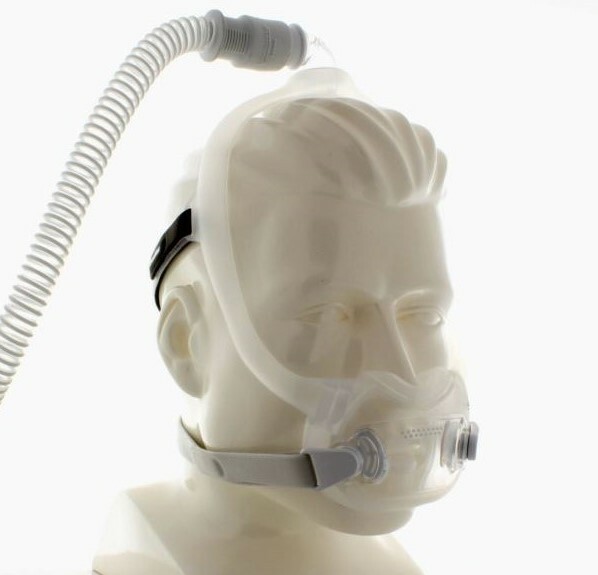 The DreamWear Full Face Mask - Fit Pack features a hollow frame design, providing a more stable hose connection at the top of the head where therapy air then travels down the frame to the cushion. This helps prevent tugging or tension on the cushion itself, creating a more reliable seal. 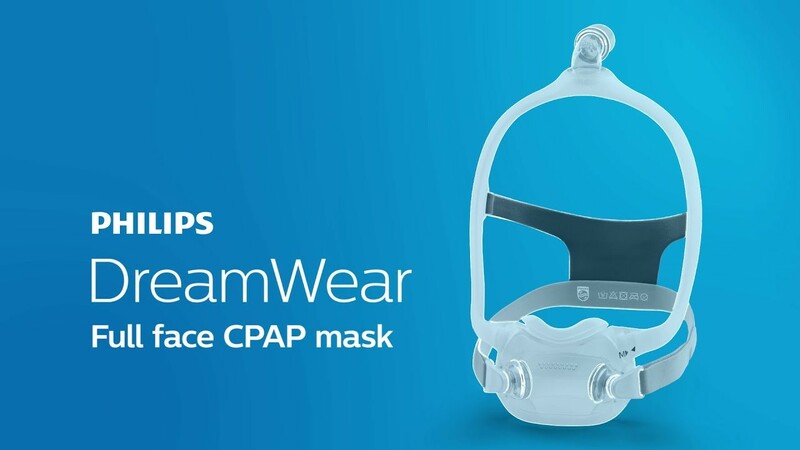 The DreamWear Full Face Mask - Fit Pack helps make the process of choosing a new CPAP mask less difficult. It includes the mask frame and cushions in all available sizes (S, M, MW, & L). This makes it easier to find the perfect fit, and perhaps a better seal. Ships TODAY if you order within the next 8 hours and 3 minutes. Watch TV, read a book, or use electronics while falling asleep with the DreamWear Full Face Mask - Fit Pack. The mask features a unique frame design, and it removes any obstructions from your view, allowing you to see-- and do-- much more than you would with a traditional full face mask. The unique design makes it a natural fit for stomach and side sleepers and also takes the guesswork out of getting the correct size, by including cushions in all available sizes. Don't need all sizes? Then please check out the DreamWear Full Face Mask with Headgear page to order the mask with cushion in selected size. By placing the hose connection on the crown of the head, it eliminates all the bulk from the front of the mask allowing natural side or stomach sleepers to sleep in their preferred position. This is a huge advantage for anyone who struggles to get comfortable at night. Open Field of Vision - See and Do More! With all the bulk cleared away from the compact cushion, you'll see-- and do-- so much more while you fall asleep. Go through a normal routine! 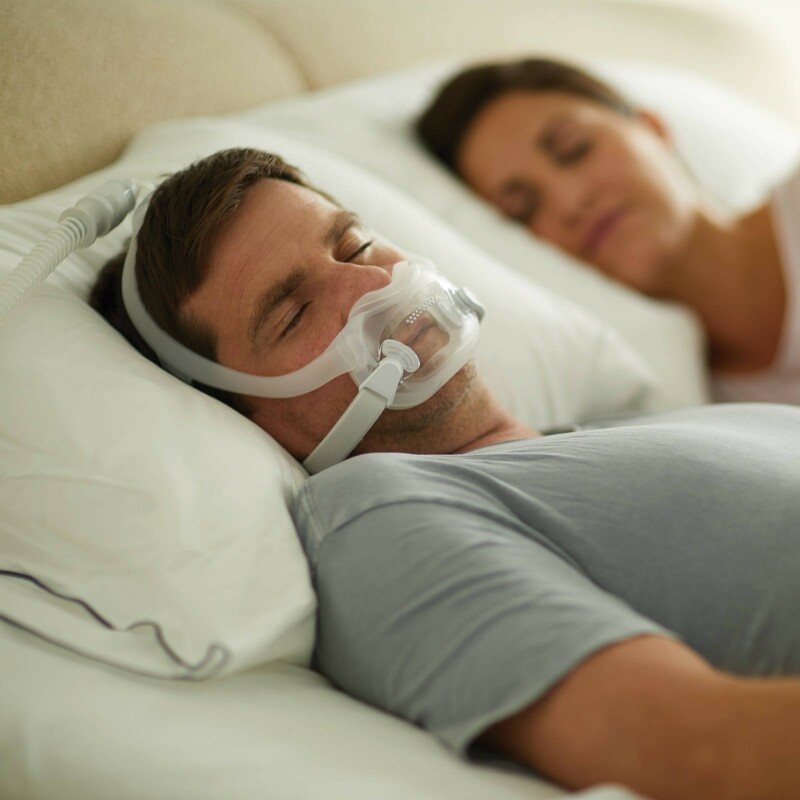 Read a book, watch TV, or send a text, while wearing your CPAP mask. The compact cushion covers the mouth and seals at the base of the nose, providing therapy air to both, without blocking the bridge of the nose. Featuring the same hollow frame design as the Nasal and Nasal Pillow versions and a hose connection at the top of the mask. This means that the frame from the DreamWear Full Face is removable and interchangeable with the other DreamWear mask versions. The frame for this mask can be removed and used with the Nasal and Nasal Pillow masks and vice-versa. 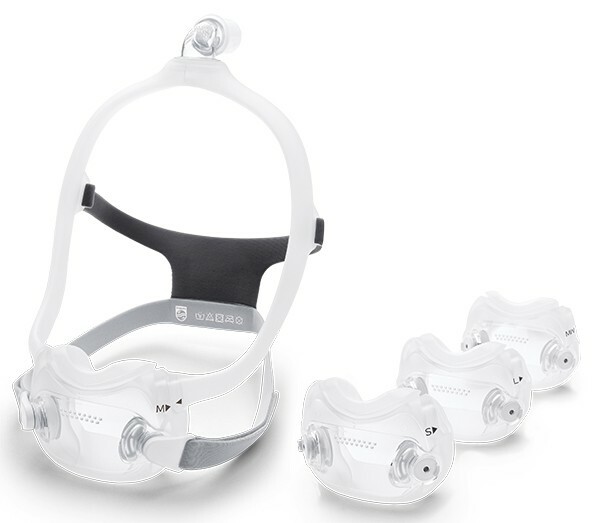 If using the frame from the Nasal or Nasal Pillow Masks, DreamWear Full Face Mask headgear would need to be purchased as the headgear is different from the Nasal or Nasal Pillow designs. The low-impact headgear supports the cushion for the DreamWear Full Face by using bottom straps intended to provide additional support for a better seal. Magnetic clips help anchor the headgear in place, using magnets in place of tension and hard plastic, and are easy to attach and detach. The DreamWear Full Face CPAP Mask - Fit Pack includes cushions of all sizes: (S, M, MW, L), which can be helpful in finding the right fit. This is great for those who don't know what cushion size will be right for them. This device uses magnets and should be kept at least 2 inches away from any medical device sensitive to magnets. This includes implanted devices such as defibrillators, pacemakers, and cochlear implants. Position the frame so the hose connection rests firmly on top of the head. Pull the headgear over back of the head. Attach the magnetic clips to the headgear.